The last knit to come off my needles, Fidra by Gudrud Johnston, introduced me to a new method of stretchy cast-on called the German Twisted cast-on or Old Norwegian cast-on. I put together a modest photo tutorial* to share my new skill. Enjoy and happy knitting! *Pssst…there’s a video down at the bottom of the post if you prefer that! Create a slip knot similar to that in a long-tail cast-on. Working-yarn to the back, tail to the front. Unlike the long-tail method where you bring your needle under and up through the middle of the loop on your thumb, here you will bring the needle under the entire loop and up on the other side closest to your index finger. Bring your needle down through the loop on your thumb. Watch you tension here. There’s still a couple more loops coming up. Bring you needle forward and up and catch the strand (from back to front) that is being held by your index finger. Move your thumb to untwist the loop being held there. 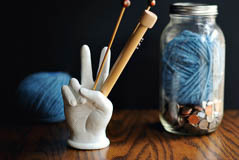 Bring the grabbed yarn down and through the untwisted loop on your thumb. Snug that little sucker up just so, et voila! Here’s a slow-mo video for those who prefer to see it done. Pardon my super amateur videography skills.